Aperture Science's "Perpetual Testing Initiative" has just undergone a major expansion. 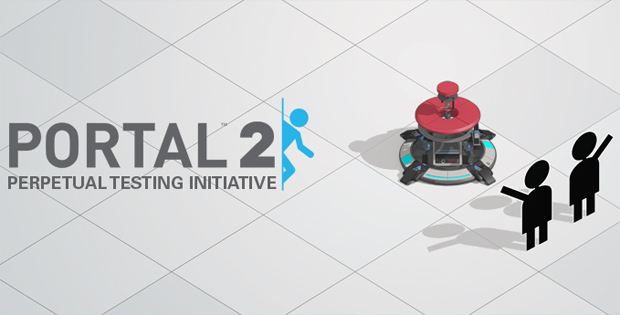 An update for Portal 2 released today which allows users to now create puzzles requiring cooperative play to add to the more than 170,000 single-player levels the community has already created since the creation tool was released this May. In addition, a new "Quick Play" option has been implemented which provides easy access to the top-rated maps across a range of categories. That sounds like a pretty good thing to have if you're going to have hundreds of thousands of stages on offer. And, in an effort to make sure every possible human being on Earth has played Portal 2, Valve has used this as an excuse to provide a tradeable 75% off coupon for the game to everybody who already has a copy of it on Steam. Toss the coupon to that one person you know, if such a thing exists, and get cracking on those test chambers!